Several cankers in this tree. Numerous fruiting bodies can be found in the infected bark tissue. Photo by Jay W. Pscheidt, 2000. Cankers on side of this 'Golden Delicious' branch. Note how the bark becomes detached. Numerous fruiting bodies can be found in this bark tissue. Bull's-eye Rot symptom on Golden Delicious apple. Note the stringy bark around the cankered area on this apple branch. Cause Cryptosporiopsis curvispora: (sexual: Neofabraea malicorticis) is the most common fungus while N. vagabunda (formerly N. alba) and C. kienholzii have also been found in western Washington. The disease is severe in the high-rainfall apple-growing areas west of the Cascade Range and coastal British Columbia. The fungus causes cankers on twigs and branches and a fruit rot commonly known as "bull's-eye rot." Fall rains spread fungal spores from limb cankers to maturing fruit and to young limbs and twigs. Risk of fruit infection that develops post-harvest increases 8 weeks before harvest. Infection occurs in the fall, but cankers will not appear until spring. Small injuries may facilitate penetration, but the fungus can penetrate uninjured bark. The canker grows actively only 1 year; however, the fungus continues to live 2 or 3 years in the dead canker tissue and produces large numbers of spores. 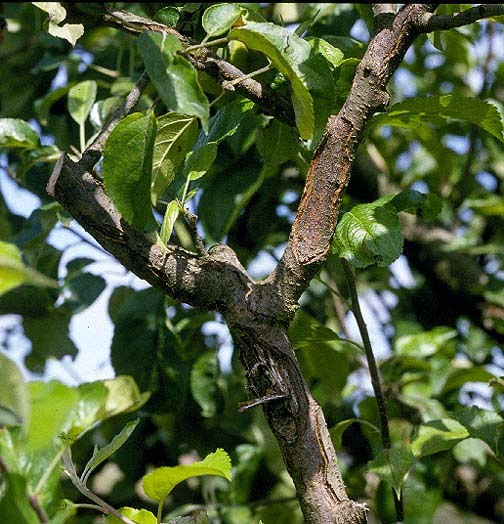 Old infected orchards and nursery stock can be sources of this disease. Other hosts such as crabapples, most pome and stone fruit, Amelanchier, hawthorn, and mountain ash may be sources if close to an orchard. All apple cultivars are susceptible; Spartan, Gala, Melrose, and Akane are highly susceptible. Symptoms Cankers are most abundant on smaller branches but may be on larger limbs or on trunks of young trees. Complete girdling often results if more than one canker is on a limb. The first apparent sign of an infection is the formation of a small, circular, reddish brown spot on the bark extending to the underlying tissues. Development of these cankers is arrested during winter. 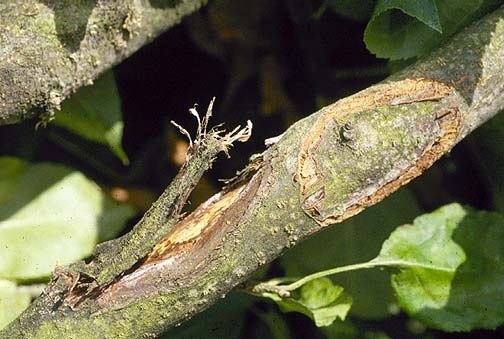 The canker expands most rapidly along the branch in spring. The cankers cease to extend and a well-marked crack forms, delimiting the canker from the surrounding healthy tissue. The surface of the canker becomes shrunken and shriveled as surrounding tissue continues to grow during the summer. The dead tissue gradually disintegrates and falls out. All that remains of it may cling to the wound for several years, forming "fiddle strings" longitudinally across the face of the canker. During summer, numerous little pustules (acervuli) appear on the canker's surface, first at the center of the area and later out to its margin. Fungus spores mature in late summer and early fall and are scattered by rain and wind. Cankers 1 year old or more will not enlarge but are a source of fungus spores. 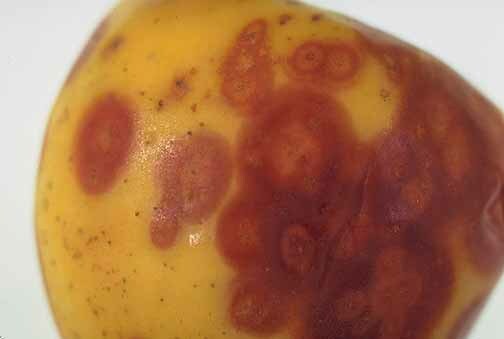 The fruit or bull's-eye rot phase of the disease shows first as brown, depressed, circular spots in storage. As a spot extends, fungus fruiting bodies (acervuli) develop in its center, often in concentric rings, which gives the name "bull's-eye" to the rot. Cultural control Aggressive scouting for and removal of cankers is the key to long term control. Whole tree removal is recommended in British Columbia when cankers are found. Establish new plantings with clean stock free of visible cankers. 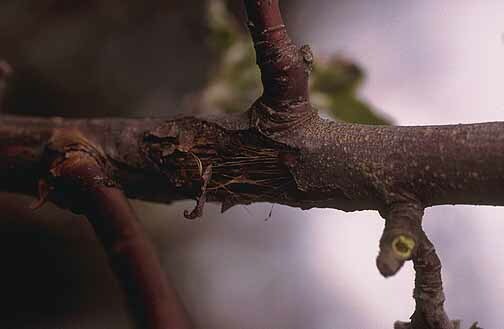 Locate new orchards as far as possible from older orchards that may have existing cankers. Scout new orchards for the disease, because early detection will aid in overall control. Prune out and burn affected twigs and branches, especially on highly susceptible cultivars. This is best done in dry weather before fall rains. On larger limbs and branches, use a sharp knife to remove cankers that are less than half the branch width. Cut out a pointed oval oriented along the axis of the branch. Chemical control Must be combined with canker removal to be effective. Relying on chemical control alone has not been successful in British Columbia. Apply a dormant bordeaux 6-6-100. Spray may be combined with the oil emulsion (3.2% actual oil) recommended for insect control. Bordeaux is not compatible with lime sulfur or polysulfide. Spray at petal fall and 2-weeks preharvest to control bull's-eye rot. Although infection can occur anytime, applications prior to rain, that might occur during the 8-week period prior to harvest, will be most effective. Captan 80 WDG at 3.75 lb/A. May be applied up to the day of harvest. Group M4 fungicide. 24-hr reentry. Mancozeb (such as Dithane , Manzate, or Penncozeb) up to 6 lb/A prebloom or at 3 lb/A after bloom. Do not combine the 6 lb/A prebloom or the 3 lb/A all-season schedules. Do not apply within 77 days of harvest. See label restrictions. Group M3 fungicides. 24-hr reentry. Pristine at 14.5 to 18.5 oz/A. Can be used day of harvest. Group 7 + 11 fungicide. 12-hr reentry. Topsin M WSB at 0.75 to 1 lb/A for apples. Do not use within 1 day of harvest. Do not use at any time in the orchard if your packing house uses a benzimidazole (such as Mertect or Decco Salt 19) postharvest. Group 1 fungicide. 2-day reentry. Ziram 76 DF at 6 lb/A. Do not use within 14 days of harvest. Group M3 fungicide. 48-hr reentry. Apply these materials before fall rains and again (about 1 month later) when leaves fall from trees. If used preharvest then they may control bull's-eye rot as well as canker development. C-O-C-S WDG at 8 to 15.5 lb/A plus dormant spray oil. 48-hr reentry. Copper-Count-N at 8 to 10 quarts/A. Postharvest only. Oregon only. 48-hr reentry. Cuprofix Ultra 40 Disperss at 8 to 20 lb/A. Postharvest only. 48-hr reentry. Kocide 3000 at 5.25 to 7 lb/A. Harvest yellow cultivars before use. 48-hr reentry. References Aguilar, C.G., Mazzola, M., and Xiao, C.L. 2017. Timing of Apple Fruit Infection by Neofabraea perennans and Neofabraea kienholzii in Relation to Bull's-eye Rot Development in Stored Apple Fruit. Plant Disease 101:800-806. Aguilar, C.G., Mazzola, M. and, Xiao, C.L. 2018. Control of bull's-eye rot of apple caused by Neofabraea perennans and Neofabraea kienholzii using pre-and postharvest fungicides. Plant Disease 102:905-910. Zang, R., Huang, L., and Xiao, C.L. 2011. Species of Neofabraea responsible for anthracnose canker of apple trees in western Washington State. Phytopathology 101:S251-S255.